I didn't have many modern dolls to start but lately they seem to be sneaking in. I've become particularly enamored of the Sylvia Natterer dolls. I also like several of the Robert Tonner dolls. I'll need to get some more pictures of them too. My Magic Attic girls are very spoiled with clothes and goodies and I have some of the really cute Kripplebush line. There are several more dolls he did that I would love to get my hands on eventually. 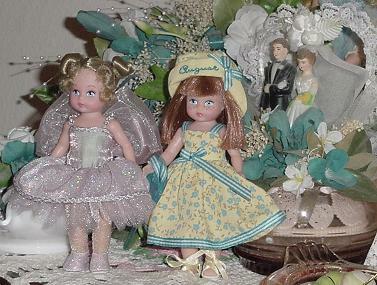 The Helen Kish dolls are beautiful too and someday I hope some find their home here. 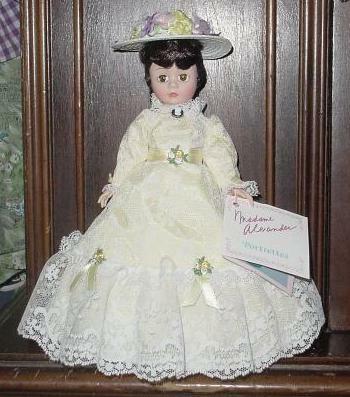 And of course the Madam Alexander dolls are still going strong and some of the new ones have found their way here too. I found the lovely doll on the right at a garage sale for $2. She was undressed. 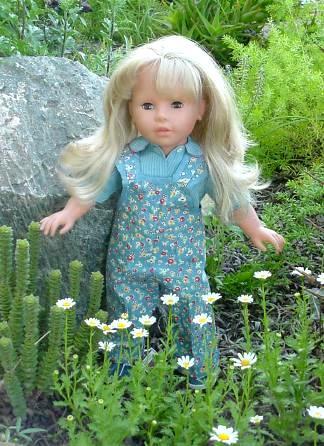 The clothes she has on here in the garden are very vintage, wonderfully all hand stitched without a machine. I feel a little guilty sine they should probably be on a composition or hard plastic doll, but they fit this one so well. She's a Zapf doll. I'm not sure who she came out as originally. She's all vinyl and a bit smaller than the American Girl dolls, though I have gotten some of the clothes that are supposed to fit those size dolls for her. This was the first modern doll that I really liked. I've tried to somewhat come up with the history of these dolls. I think they put out this one in a ballet outfit, which I don't have she has brown eyes which is somewhat unusual in a blonde doll. Later Zapf marketed 3 dolls with the same mold. They were under the BabyCakes line of dolls as "Friends of BabyCakes". I later bought the MIB Elisabeth from this line. She has brown hair and eyes, and comes in a cute red plaid dress. The other 2 are blondes, Jennifer comes in a pink birthday dress, I'm not sure if she has blue or brown eyes. And then the 3rd doll I don't know her name but she has blue eyes and comes in a business suit. I don't think any of these dolls are still being made. Above are the first of my Natterer dolls. The tall one is the first I got she's Sofia. She has several outfits now and she's not wearing her original clothes in this photo, or the one below. The smaller girl is an earlier White Balloon Natterer doll, Lea. She is in her original outfit in this photo. She was a Christmas gift from a dear friend in '03. The baby is a Gotz doll but no artist is listed. The stroller goes with a whole group of baby furniture I got for him. I took this photo while the Natterer kids were out in the rain looking for their new friend Ariane that was coming in the mail. And Ariane came! But not for a few days, when it was sunny again. Sofia and Lea came out in their spring dresses to greet Ariane. Lea just loved Ariane's sweater and Ariane very graciously let Lea try it on, though all the girls agreed it was a little too big for Lea. The girls are all best of friends now and help take care of the baby. A little boy, the very cute White Balloon red headed New York, has since come to live here and brought a baby sister with him. So the 4 children and 2 babies keep each other very busy, though none of the children has caused any mischief. Eventually I'll get the camera out to take photos of the newer Natterer friends. Finally my modern Alexanders. This is not all of them. I'm just way behind in photos. The first photo, to the left is a Cissette doll. She's from the portrait series. I got her for my birthday in '03 at the doll museum in downtown Phoenix. My husband (poor man dragged to the doll museum, not his first choice of fun things to do) and I had gone to the museum, then gotten an snack next door. Then we went back to the museum to get the doll and they had closed early. I was so sad. But my husband went back and surprised me with her the next day. He didn't say anything she was just standing on a table in our bedroom. I was very pleased. And last but not least below are tiny little Alexanders. They're about 5 inches tall. I just think they are so cute. These are August and Tinkerbell. Snow White has moved in since. I love the fairy tale dolls. I really like some of the other month girls a lot too. I also have some of the newer Alexanderkins but I need to get their photos up.